What little girl wouldn't love to have a princess cake for her royal birthday party? 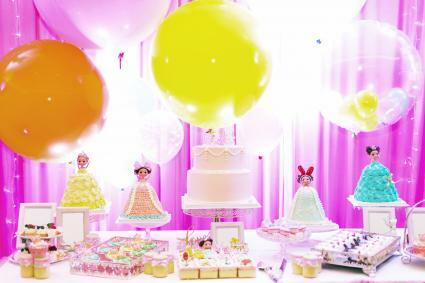 Whether you make your own cake at home or order one from your favorite bakery, there are countless creative options that should thrill any little girl. 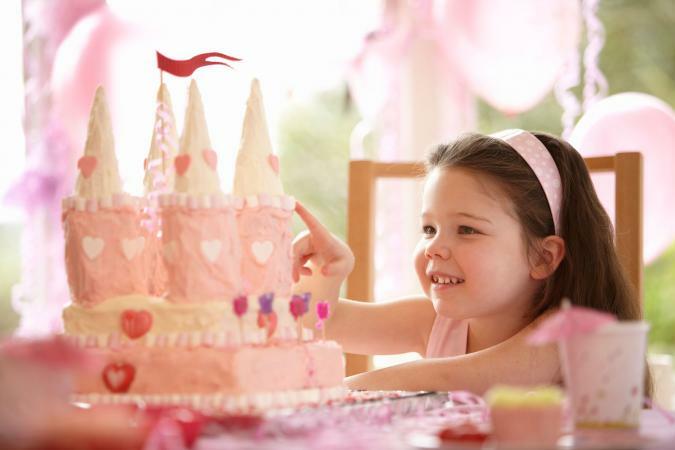 Use special pans or cake carving techniques to make a cake in the shape of a crown, glass slipper, scepter, or even a castle. If you're using a specific princess character as the party theme, brainstorm shapes that match her story and would work well in cake form. Nothing says "princess" more than a stunning castle. 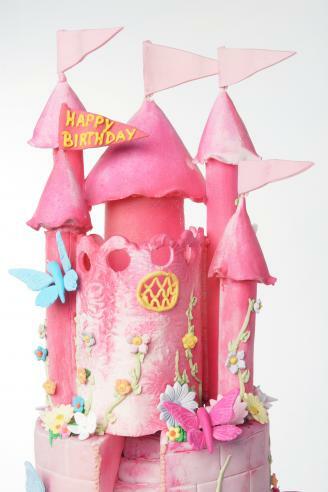 Follow these instructions to make an easy, but elegant birthday castle. Bake two square cake layers and one round cake layer, in any flavor of your choice. Remove the layers from the pan and allow them to cool. Note: Pudding cakes and pound cakes layer well and stay moist. Frost one of the square cake layers on its top; place the second square layer on top of the first, and ice the top and sides of the cake. Trim the round cake so it is a 7" circle; place it on top of the frosted square cake and frost the top and sides. You have the basic structure of your castle. Frost the exterior of four ice cream cones and place them on the corners of the cake as "turrets." Decorate your castle with shimmering sugars and candy; use decorating icing to outline windows and parapets. Optional: Frost a graham cracker and place it next to the princess castle to make a drawbridge; use licorice laces to make the chains for the drawbridge and use icing to anchor them. Want a cake that is a princess? It is really easy to make a princess doll cake using a bundt cake and a small fashion doll. Once your Bundt cake is baked and cool, turn it onto a cake platter. Frost the outside of the cake and place some frosting in the center hole to help hold the doll in place. You can wrap the doll's waist and legs with cling wrap if you want to prevent icing from getting into her joints. Place the doll into the center of the cake. Fill in frosting around the doll's waist. Use decorating icing to cover the doll's bodice. A small star tip is easy to use and covers well. Decorate the doll's "skirt" with decorating icing to make ruffles, bows or flowers. Add sprinkles or sugar as desired. 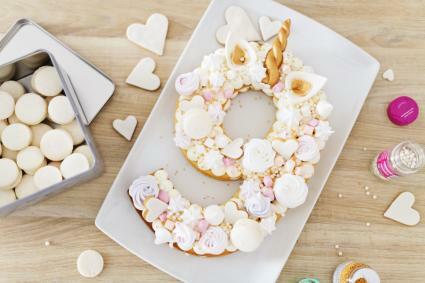 If you're confident in your piping skills or have bought small princess themed candies to decorate with, you can create a modern princess number cake. Use the age of your little princess as the number shape for your cake. If you want to use a number template, simply print out a large number coloring page and cut out the number. Lay the template in the center of your cake and trace around it with the toothpick. If you are comfortable free-hand cutting, start by drawing your chosen number on top of the cake with the toothpick. Use the large knife to cut out your number shape. Frost the entire cake with a crumb coat and refrigerate until hardened. Add your final layer of frosting, getting it as smooth as possible. Create a repeating pattern across the number cake with your decorating icing or candies. For example, your pattern could be a crown, jewel, cursive letter of your girl's first name. You would repeat this pattern horizontally across the cake then move down to the next row and continue it. If you are artistic or creative, it can be pretty easy to use your favorite princess' color scheme to create a cute sheet cake. When cake decorating isn't your top skill, there are still plenty of simple ways to make any sheet cake look royal. 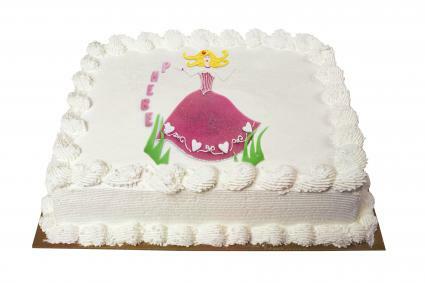 Create the likeness of your favorite princess on any size sheet cake and thrill your resident royal. This process takes several hours to complete, so give yourself enough time the day before the party to prepare. Purchase or make a blank sheet cake with white frosting on the top. It's okay to have some decorations around the edges. Place your coloring sheet face-up on the cutting board and tape in place. Tape a piece of waxed paper over your coloring page. Mix the food coloring with your buttercream frosting to get all the colors you need to complete the image. Using the coloring sheet as a guide, trace the lines with the black frosting. Fill in the image with colored buttercream frosting. Place the whole cutting board in your freezer for at least 2 hours, but up to one full day. When frozen, remove the cutting board and take off all the tape. Carefully flip your design onto the top of your sheet cake and gently press down. Slowly remove the waxed paper. Touch up any areas in need with frosting. 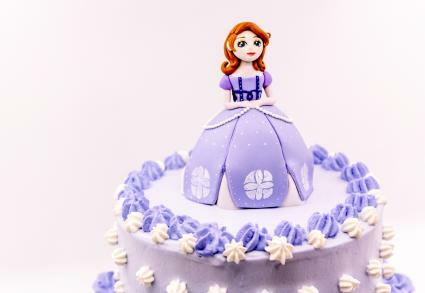 There are several easy ways you can use princess figurines to decorate a simple sheet cake. Visit your local party supply store for an assortment of princess figurines. Make sure to select ones that are intended for use on cakes or other food. You can choose a single princess or get an array of princesses to decorate the cake. Take any iced sheet or layer cake and place princess figures on it. Place sprinkles around them. Finish with curls of ribbon or fresh miniature roses. Place one or more figurines on the top of the cake. Use matching frosting to cover the skirt portion only of the figurine or the entire dress and hair. This gives the toy a fuller look and matches the texture of the cake's frosting. Use the figurine as a model or guide to sculpt your own version out of modeling chocolate or fondant. If your attempt doesn't turn out great, you can still just place the figurine on the cake. Place figurines around the outside of the cake on the serving dish so they serve as decorations, but don't get confused as edible elements. Top some cupcakes with sparkly sugar and tiara or princess wand toppers for a simple, easy-to-make and serve birthday treat. 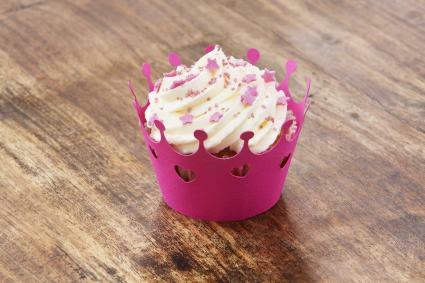 Look for printable princess themed cupcake wrappers buy some at a party supply store. If you find blank ones, you can use metallic markers to write your little princess' name on the outside for a custom look. If you can't find what you're looking for at a store, make your own. Bake and frost your cupcakes then measure the height. Shrink down the paper crown template so it is slightly taller than your frosted cupcake. You may need two crowns for each cupcake so it wraps around the whole thing. Print as many small crowns as you need then cut and color them. When finished, wrap the mini paper crowns around your cupcake's liner and tape in place. 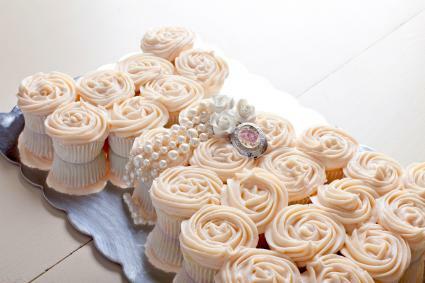 Use cupcakes placed close together to create the shape of a princess gown or crown. The end result looks like a single cake but actually features only individual cupcakes. Pipe frosting in swirling patterns across the entire top of the cupcakes. Do not frost individual cupcakes, but rather the whole structure as one cake. Use the decorating gel and jewels to decorate the crown. 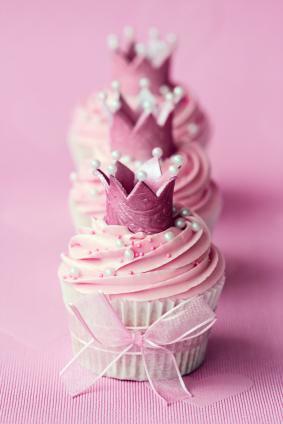 Every princess needs a crown, and these cupcakes are perfect for a little girl's fantasy birthday party. Use an open star tip to pipe a swirl of icing on each cupcake. Roll out the fondant to about 1/8-inch thick. Cut a straight edge down one side. Cut zig-zags down the opposite side. Cut the strips into separate sections you'll form into circles to create crowns. Place the crowns, straight edge down, on the icing swirls. Attach a pearl to each tip of each crown using edible glue. Lightly sprinkle nonpareils and a few more candy pearls on the cupcakes and tie a ribbon bow around each one. Creating a princess cake doesn't have to be difficult. You can add a few princess elements to any store-bought or homemade cake frosted in your princess theme colors. Character cake pans come in nearly every shape and size. You can find cake pans shaped like your daughter's favorite Disney Princess, a crown, castle, carriage, or gown. They come with easy baking and decorating instructions. Since the cake will already have a detailed shape, you can easily see how to frost different sections or elements of the overall shape. 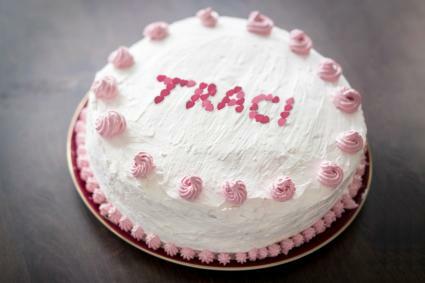 If you don't want to lose too much of the shape, consider drizzling a thin pink icing glaze over the entire cake to add some color and keep the details clear. 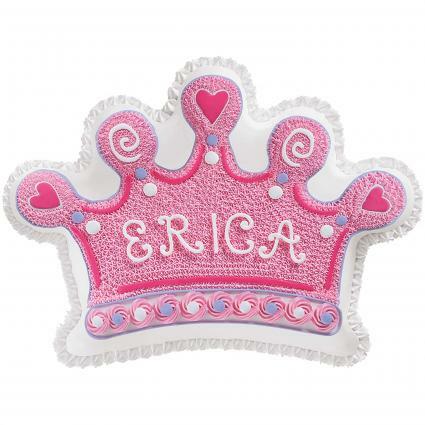 Give your little princess a cake with her name on it using edible jewels or transparent, brightly colored candies in round shapes. Start with any size and shape cake that is frosted with your theme colors. Take any small edible treats that resemble royal jewels and use them to spell out your child's name across the center of the cake. Add edible pearls and piles of edible jewels to the corners of the cake. 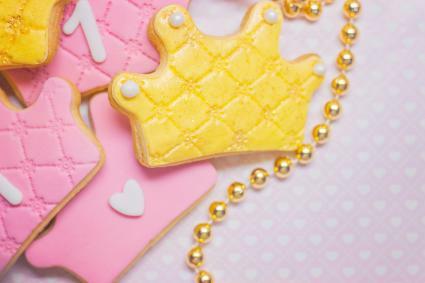 Use a crown or princess shaped cookie cutter to make simple cutout sugar cookies. Once cool, frost the cookies and decorate each with some detail. On a large platter, place the cookies in the shape of a crown, gown, or another princess item then stack the rest of the cookies on top of this design. Another option is to use your cookies to decorate a standard cake. You can place them along the sides of a multi-tier cake or on the top of a sheet cake. Since you'll decorate each cookie individually, you can choose the best ones to go on the cake removing some of the pressure of getting direct-to-cake decorating perfect. 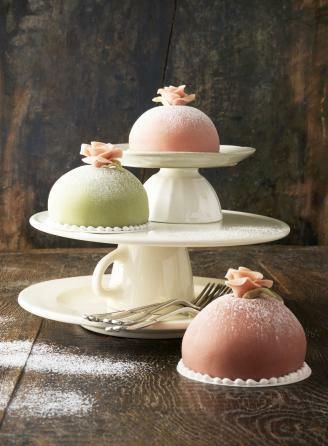 If decorating just isn't your thing, consider making a Classic Swedish Princess Cake. The traditional version is covered in marzipan and features several filling layers. You can simplify this recipe by layering three layers of sponge cake with raspberry or strawberry jam between cake layers. Use a dome-shaped pan or a smooth bundt pan to get the classic dome shape. When using a bundt pan, fill the center with frosting so your dome doesn't cave in. You can also just add some stiff frosting to the top of a round cake to get the dome shape. Swap the green marzipan for pre-made pink or white fondant to get the smooth outside. Traditionally these cakes are decorated very sparsely with just one or a few edible roses. Before you begin designing your princess cake, ask the birthday girl for her own ideas about what she thinks would make her cake perfect. That way you can create a very customized cake that's sure to please her.